Here is an idea for testing the mix between the IoT and chemlambda. This post almost qualifies as an What if? one but not quite, because in principle it might be done right now, not in the future. Experiments have to start from somewhere in order to arrive eventually to something like a Microbiome OS. It’s Node-compatible and ships with Wifi built in. Imagine that there is one GLC actor per Tessel device. The interactions between GLC actors may be done partially via the Wifi. The advantage is that one may overlap the locality of graph rewrites of chemlambda with space locality. Each GLC actor has as data a chemlambda molecule, with it’s in and out free arrows (or free chemical bonds) tagged with names of other actors. A bond between two actors form, in the chemlambda+Tessel world, if the actors are close enough to communicate via Wifi. Look for example at the beta move, done via the behaviour 1 of GLC actors. 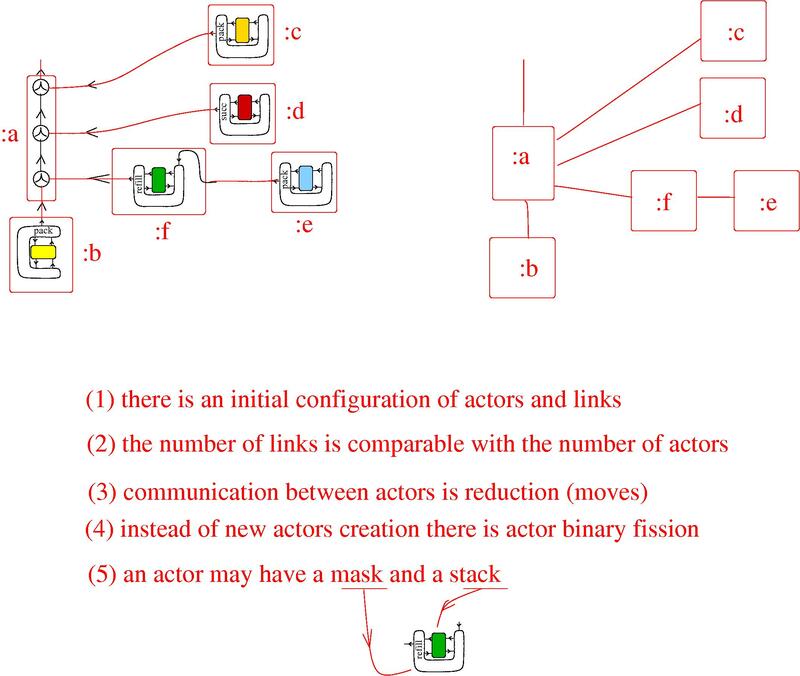 This may involve up to 6 actors, namely the two actors which communicate via the graphic beta move and at most 4 other actors which have to modify their tags of neighbouring actors names as a result of the move. If all are locally connected by Wifi then this becomes straightforward. What would be the experiment then? To perform distributed, decentralized computations with chemlambda (in particular to do functional programming in a decentralized way) which are also sprawled over the physical world. The Tessel devices involved in the computation don’t have to be all in possible Wifi connections with the others, on the contrary, only local connections would be enough. Moreover, the results of the computations could as well have physical effects (in the sense that the states of the actors could produce effects in the real world) and as well the physical world could be used as input for the computation (i.e. the sensors connected to Tessel devices could modify the state of the actor via a core-mask mechanism). That would play the role of a very primitive, but functional, experimental ancestor of a Microbiome OS. As well, it could be just a representation of the state of the IoT in a small neighbourhood of you, according to the press release describing SeaWater, the new product of Autodesk. “SeaWater is a design tool for the artificial life based decentralized Internet of Things. 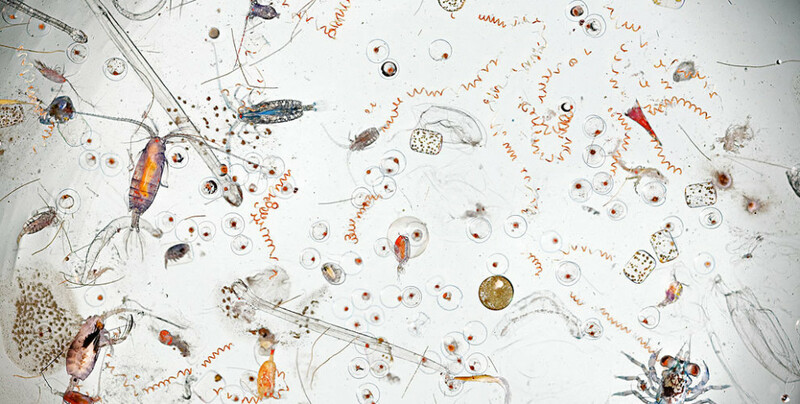 Each of the tiny plankton beings which appear in the picture is actually a program, technically called a GLC actor. Each plankton being has it’s own umwelt, it’s own representation of the medium which surrounds it. Spatially close beings in the picture share the same surrounding and thus they can interact. Likewise, the tiny GLC actors interact locally one with another, not in real space, but on the Net. There is no real space in the Net, instead, SeaWater represents them closer when they do interact. Sea Water is a tool for Net designers. We humans are visual beings. A lot of our primate brains powers can be harnessed for designing the alife decentralized computing which form the basis of the Internet of Things. Context. Recall that IoT is only a bridge between two worlds: the real one, where life is ruled by real chemistry and the artificial one, based on some variant of an artificial chemistry, aka chemlambda. As Andrew Hessel points out, life is a programming language (chemically based), as well as the virtual world. They are the same, sharing the same principles of computation. The IoT is a translation tool which unites these worlds and lets them be one. This is the far reaching goal. But in the meantime we have to learn how to design this. Imagine that we may import real beings, say microbes, to our own unique Microbiome OS. There is no fundamental difference between synthetic life, artificial life and real life, at least at this bottom level. Instead of aiming for human or superhuman artificial intelligence, the alife decentralized computing community wants to build a world where humans are not treated like bayesian units by pyramidal centralized constructs. There is an immense computing power already at the bottom of alife, where synthetic biology offers many valuable lessons. UPDATE. This is real: Autodesk Builds Its Own Virus, as the Software Giant Develops Design Tools for Life Itself.